Wow, what a crazy time we have had for the last month. First, Janice flew to Utah to help her daughter pick out a wedding dress and of course, to SEW. We worked feverishly, then she and I flew to Florida for seven more days of work before we left for Pittsburg. 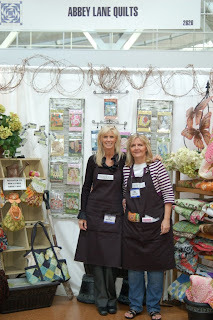 We have 10 new patterns, 2 redo's, and were in four booths in Pittsburg. Crazy, I know. We took the last quilt out of the dryer on Tuesday night at 8 p.m. the day before setup in Pittsburg. We got in the car and started driving. We drove straight to the convention center arriving Wednesday about 4 in the afternoon. We made some photo shoot stops in West Virginia and other than that just drove like crazy. When we set up the booth, we are never quite sure just what it is going to look like when we are done. We have an idea when we start, this time is was supposed to look like the inside of an old gardening shed and the quilts were our plants and flowers. I think we did a great job, and there were lots of photos by the attendees wanting to make their shops look a little like our booth. We had soooooo much stuff to show, that we were a little crowded. I am just going to post the pictures. 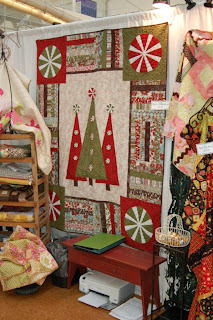 There were a couple of shots of the whole floor from above, and pictures of our quilts that were in Lila Tueller's Booth, Studio E Fabrics booth and the Moda shop. Check out all the pictures on Flickr, http://www.flickr.com/photos/abbeylanequilts/?saved=1. I will be posting the new patterns here on the blog as soon as they are done. The first three are ready now, so you will get the first peak here. This is MY TICKET TO RIDE. 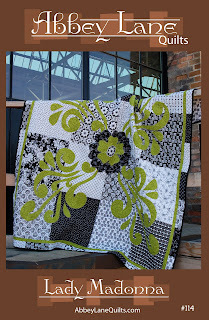 It is a redo of one of our favorite patterns. We loved the design so much we decided to update it with fresh new fabrics. The result is beautiful. 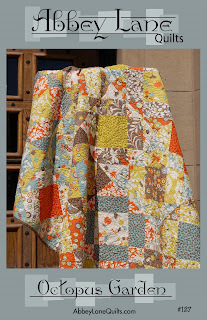 You can see all the details for each of these new patterns on our website, http://www.abbeylanequilts.com/ . This is also a redo. LADY MADONNA is now in Black and Whites. 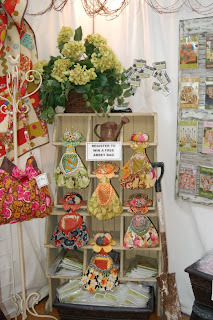 This one with green scrolls hung in our booth. 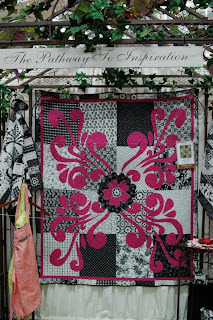 And this pink one hung in Studio E Fabrics booth. They we re kind enough to supply us with the fabric. It is from their Black and White basics collection. 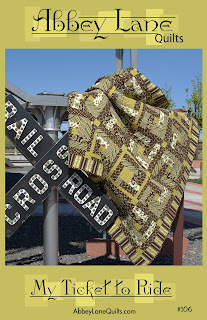 Check out all their fabrics at http://www.studioefabrics.com. Lot's happening in the next couple of weeks, so keep checking back. As each pattern is finished, it will be listed on the website, http://www.abbeylanequilts.com/ for purchase. 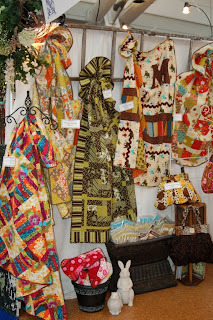 So Many Quilts, soooooo little time. Hope you enjoy all the new projects as much as we do.